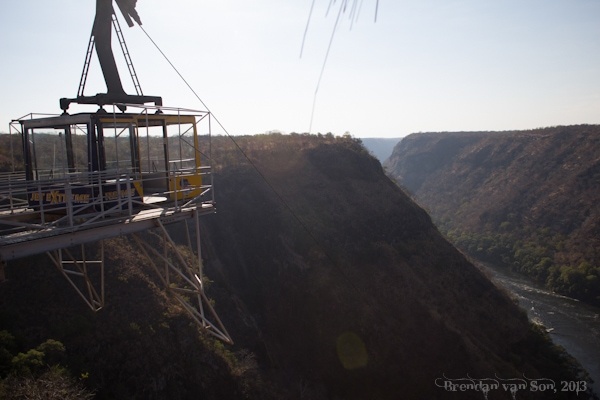 In stark contrast to the peaceful day I had cruising the Zambezi River, or the calm of a flight in a helicopter I took over Victoria Falls, today I’m gripping the cold rails of a speed boat while bouncing over rapids and tearing inches past cliff edges. 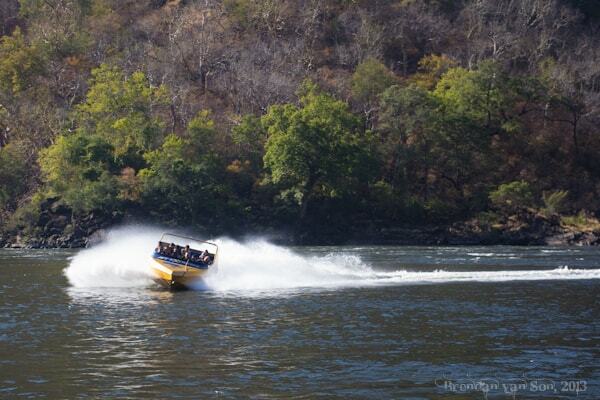 Jet Boat Extreme plies the waters of the Zambezi below Victoria Falls, and today I’m a guest on their boat. 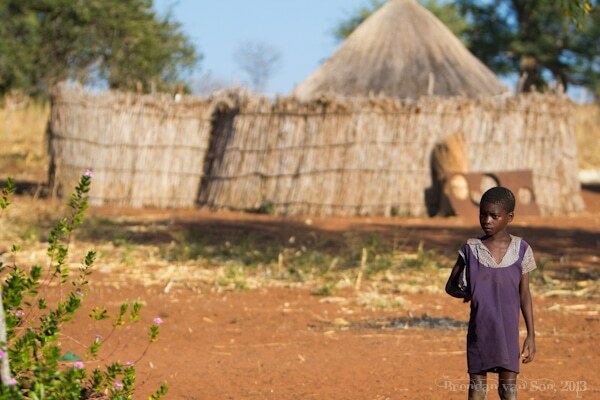 The trip started in the back of a safari-style truck which bumped along a dirt road through the Zambia countryside and past the village of a paramount king. We skimmed past fields of acacia trees and dramatic baobabs. Bikes were slowly peddled by men carrying loads of goods ear-marked for Livingstone market. As we passed by roadside huts, children waved or just stared in curiosity. The sun began to tip over the horizon as we arrived at the edge of the gorge. A bright gust of light reflected off of the Zambezi river below and I strained my eyes to imagine how we’d jet boat through the waters. Soon after signing our lives away, we boarded a gondola and dipped into the shade of the flat-walled gorge. Our group stepped into the boat and shuffled around. I started to wonder why the majority of the group was squished into one row, nearly unable to move rather than filing comfortably into the open rows of the jet boat. I’m soon to find out that it’s been done to keep us from popping out of the boat during high g-force spins of sudden air-bound jumps over rapids. I gripped the cold rails, and we back out into the river. 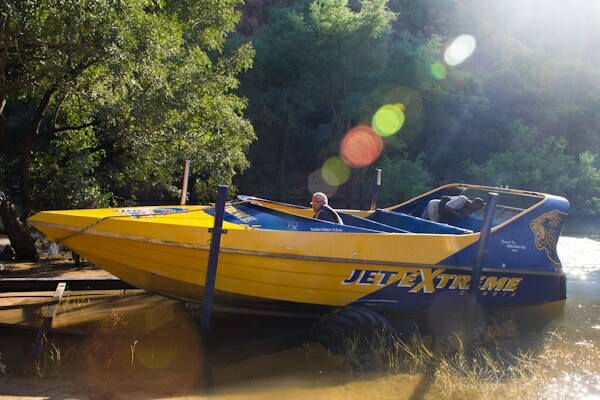 The driver, and owner of Jet Boat Extreme, doesn’t ease us into the river. Rather he tears into the river and dives the boat into a stop to a choir of cheers from the passengers. The boat stops and he leans on the ledge and explains the rules meant to keep us from falling in the river, losing fingers on the rocks, or popping out your shoulder in the boat: hands in the boat, hold on to the rails, no jumping out of the boat, and most of all when he yells “spin” to hang on for dear life. The power of the boat is impressive. We go from still to top speed in mere seconds. The agility of the jet boat is perhaps even more impressive. When the call of “spin” is shouted out, we go from top speed to pointing the opposite direction and motionless in less than a split second. Each time the boat surges or turns there is a sea of cheers. The entire time there is a chorus of giggles. The yellow boat soon makes a tear for the rapids of the river. It’s the first time I’ve ever seen the great Zambezi River tamed. The boat tears up the water and changes the dynamic of the wave flow. Occasionally a wave challenges our boat and we are sent soaring over it and then crashing down on the other side. When a wave stands down, the nose of the jet boat dives into the following ripple and an army of water overcomes the boat and soaks us all to the core. My the time we come to a stop at the dock, some passengers are soaked, some are bruised, and we all have giant grins on our faces and adrenaline floating through our veins. There is such a power to the Zambezi and all of us seem to hold a bit of pride in the idea that we beat it. But at the end of the day, we’ve just spent a couple minutes carving this river, while the river has been carving the world for millions of years. And while we are pulling out of the canyon via a gondola, this river will continue to show it’s force for millions of years to come. Once again, I am humbled by this incredible stretch of water.